Growing up, most of probably read about mermaids, angels and other fantastical creatures in fairytale books. We might even have dreamed of meeting — or becoming — one as children. What makes mermaiding a unique sport? You got it right when you called it a sport! Mermaid performers work incredibly hard to make what we do look effortless, but it’s an extremely demanding sport — not just physically, but in terms of time and financial investment as well. Mermaiding for recreation is a wonderful hobby; it straddles the line between fantasy and fitness. I think that’s one of the main reasons my mermaid school has been so well received — who wouldn’t love to get fit while living out their favourite childhood fantasy? How did you start exploring mermaiding? I’ve always loved mermaids. I don’t remember a time when I wasn’t absolutely inspired and fascinated by the old seafarers’ tales of these mythical, magical creatures. When I was a little girl, one of my favourite things to do was to sit by the ocean and imagine I could see mermaids’ tails flickering beneath the water. I used to pretend I was a mermaid in the pool, too — I would rope my siblings and cousins in and initiate them as members of the mer-kingdom, and take them on mermaid adventures! I was blessed to have a family who raised me on a rich literary diet and encouraged creativity, so I grew up quite an imaginative child. It makes me laugh, sometimes, that I’m still dreaming the same dreams I used to when I was a little girl — only, of course, on a scale beyond what I probably could imagine! What about mermaiding attracts and drives you? Like I said, I’ve always been attracted to the mermaid culture. I like to think I was a mermaid long before I had my fins. I often tell people that being a mermaid isn’t necessarily about wearing a tail and splashing about in the water — it’s about possessing a certain mindset, living by a certain set of values, carrying yourself with a certain kind of grace, facing life with a certain kind of strength. Being a mermaid is empowering. When people inhabit this kind of fantastical, otherworldly persona, they learn things about themselves that they didn’t realise in their “regular, human” form. For example, I’ve struggled with asthma and some sports injuries for many years, and have also had several (unrelated) near-drowning experiences in my childhood. I’m not always the strongest, or the fastest person around. But when I’m in my mermaid form, I feel strong, graceful, and confident. I’ve seen the same phenomenon in the students in my mermaid school: shyness turns to confidence, insecurities turn into self-love. It’s a beautiful thing. Turning my love for mermaid culture from a fun, casual, recreational type thing into a career, though, was a daunting leap. While a lot of people were supportive, others were doubtful, even critical – and I don’t blame them! Splashing around in the pool once or twice a week is incredible fun, but becoming a full-fledged mermaid performer requires intense amounts of dedication, perseverance, gains and losses, sacrifices, training, and hefty time and monetary investments. That said, I loved the challenge of using my strengths to create a career for myself. For example, I’ve always loved singing, so I often sing and entertain at events. My previous experience as an emcee and freelance actor also enables me to interact with my audience. Writing has always been my first love, so that comes in handy when I’m crafting content for my webpages. I believe it’s my passion that continues to drive me, even when times get challenging. I want to kindle the spark of magic and awe in the eyes of the little ones and the families that I meet. I want to help spread the message that you are beautiful, wonderful, and loved. That’s what drives me. What is a common misconception about being a mermaid performer that people have? That it’s easy! Not that I’m complaining, of course, because at the end of the day, I chose this career, and I’m passionate about it. But there’s definitely a lot of hard work that goes on behind the scenes that enables what I do to look easy and effortless. What FAQs do you get during events? Some of my personal favourites: “Do you know Ariel”? I have an entire tale mapped out about Ariel (my distant cousin) and King Triton (my uncle) and the adventures we’ve had. The little ones love it. What are the challenges of being a mermaid performer? For one, my mobility in a 15kg tail is extremely limited on land — my mertender is basically my only means of transportation. It doesn’t feel as heavy in the water, of course, but it does take training to get used to maneuvering a large fluke underwater. It was also daunting getting used to underwater vision. I’ve always been able to open my eyes in water, but once I’m down there, I see everything in blurry, vague shapes and smudges. It can be very disorientating, and on top of that, you’re trying to hold your breath AND look at ease as well. You have to really discipline yourself to remain calm and give the illusion of looking effortless and comfortable underwater. Health hazards are also prevalent: I struggle with back issues, eye infections, and sinus infections. Chlorine can be incredibly damaging, so after an event or photoshoot I can usually be seen with bloodshot, stinging eyes and crazy sinuses. It isn’t glamorous, but it’s the price to pay for creating a magical illusion. My eyes have become hypersensitive, and are prone to eye inflammations and discomfort. I also struggle with maintaining my hair! It’s an uphill battle trying to combat the damage from chlorine. I use a lot of conditioners and hair masks religiously, but my hair has still become prone to breakage. I’d cut it into a bob if I could, but I do love the long-haired mermaid aesthetic, so I try and make do. What’s your advice for someone who wants to enroll in mermaid school? What must the person be prepared for? Mermaid school is for everybody! What I love about mermaid culture is that regardless of fitness level, body shape and size, gender, age, and physical ability, there’s something for everyone. Everyone deserves the chance to live out their childhood fantasy and feel strong, powerful, beautiful, and free. As safety requisites, we require students to be able to swim 1 – 2 laps (without fins) independently, and be able to tread water for 20 seconds. Share more about what one can expect in a class. Singapore’s Mermaid School comprises 4 levels: Bronze, Silver, Gold, and Platinum. Each level comprises 4-5 sessions. I’ve developed a unique syllabus, the first of its kind, to fully immerse students in the mermaid experience. Each session starts with a theory section, followed by a swimming section. The theoretical syllabus introduces aspiring mers to the world of mermaid culture and mythology, and at every level, we’ve got a different focus to the theory sessions. For example, in the Bronze Level, students are taught the 101 of mermaid lore and mythology. I believe that to be a true blue mer, it’s important to understand the rich, nuanced heritage that surrounds the subject of these creatures. 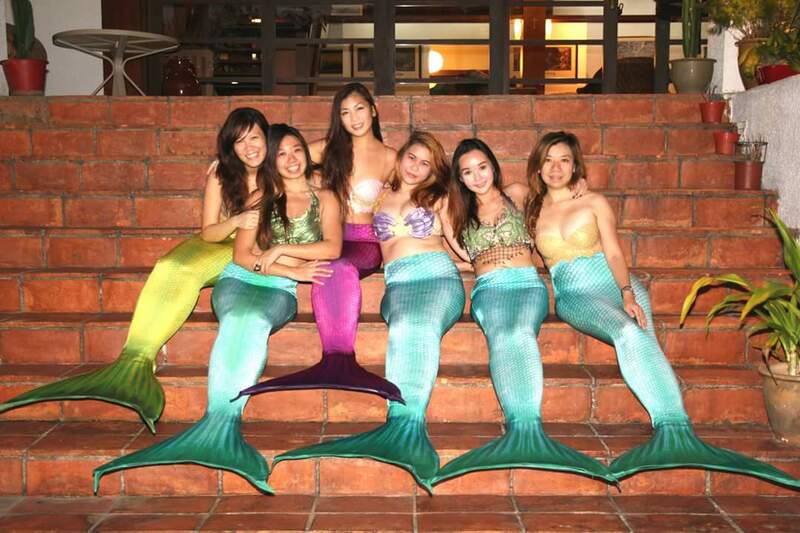 Students also learn about the core values of Singapore’s Mermaid School: Strength, Beauty, and Love. For me, these values sum up what it means to live like a mermaid. 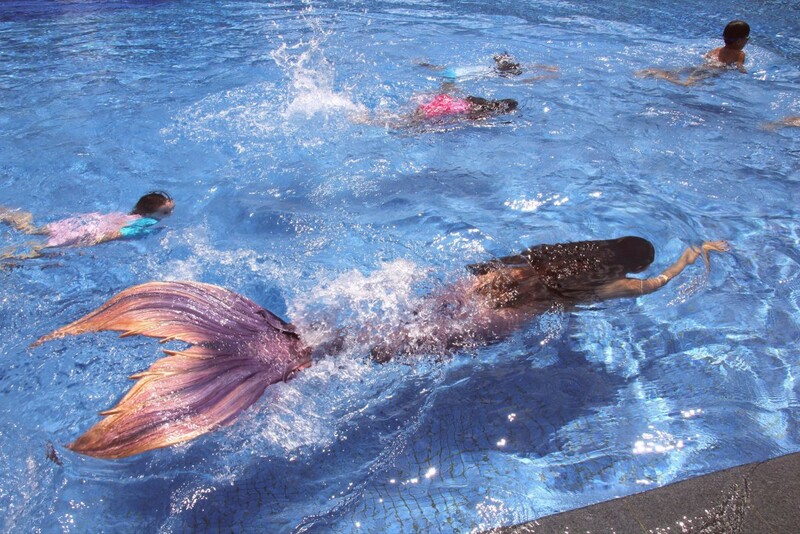 After the theory section, my merlings will head to the pool, where we have a stretching session and don our tails. Sometimes, I incorporate conditioning exercises into the program to hone and tone the muscles you activate while mermaiding, for example, the abs, back, and core. After that, it’s time to dive in! 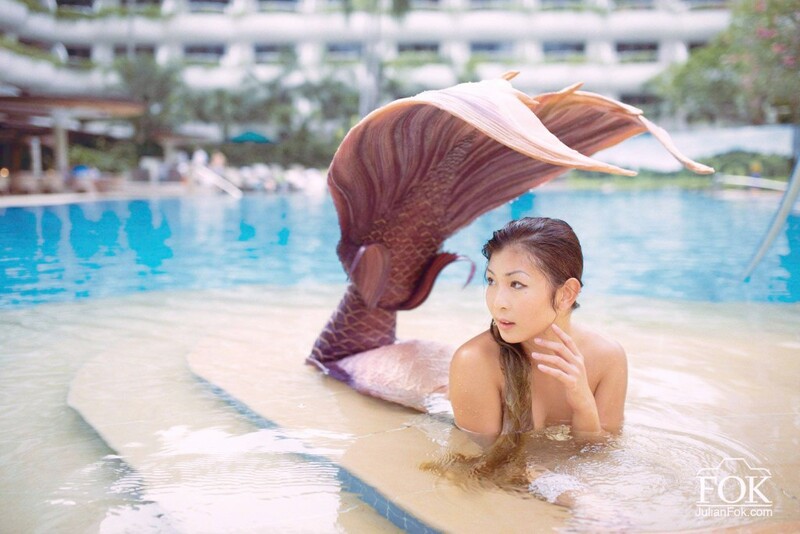 You’ll learn different mermaid techniques and tricks at each level. At the Bronze Level, we work on building a strong, solid foundation and kick technique with the use of flotation aids. As you progress through the levels, you’ll learn more advanced techniques and mermaid tricks. What do you hope to achieve by setting up the school? I believe fellowship and friendship are extremely important. Too often, we learn from a young age that we should stifle any and all inclinations towards the fantastical, the wonderful, the magical, and the sublime. 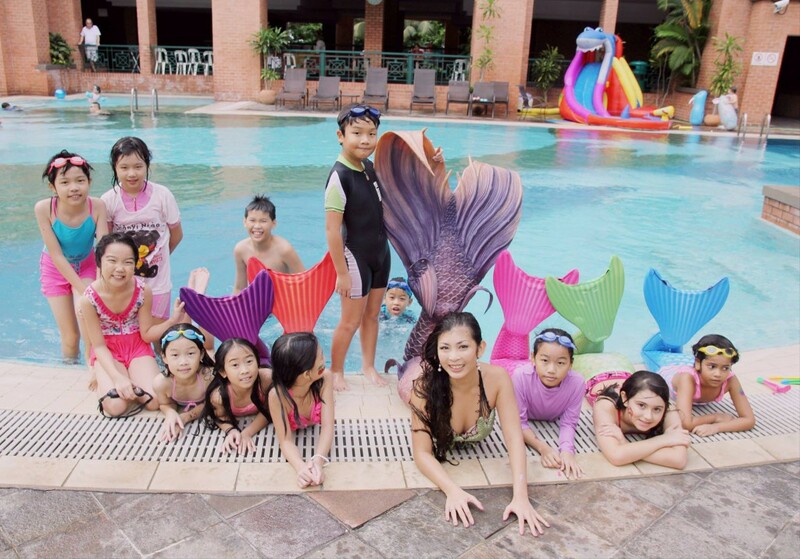 Singapore’s Mermaid School is a safe, nurturing space that encourages imagination, creativity, and being more than ordinary. It’s a place for you to live your dreams, surrounded by people who share those dreams as well. 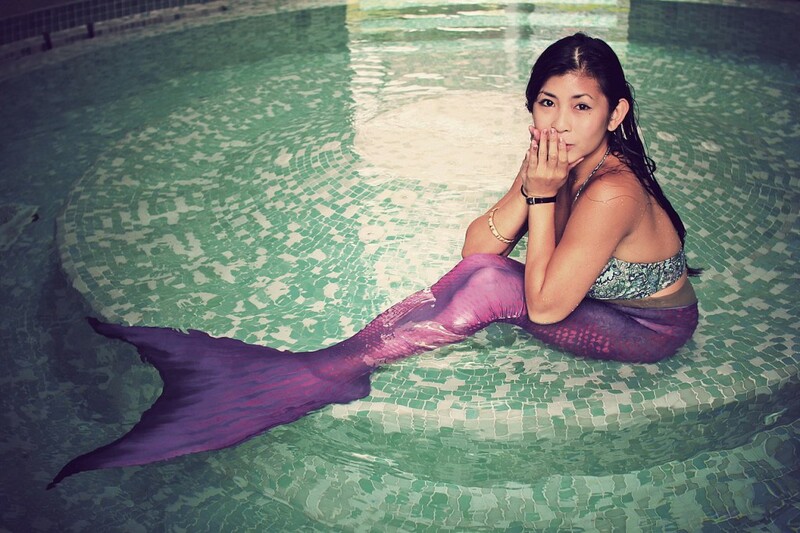 I hope to educate my pod of mermaids and mermen on the 3 values at the heart of the Singapore Mermaid School, to discover your inner and physical strength, to accept yourself for the beautiful, unique being you are, and to extend love to the community around you. 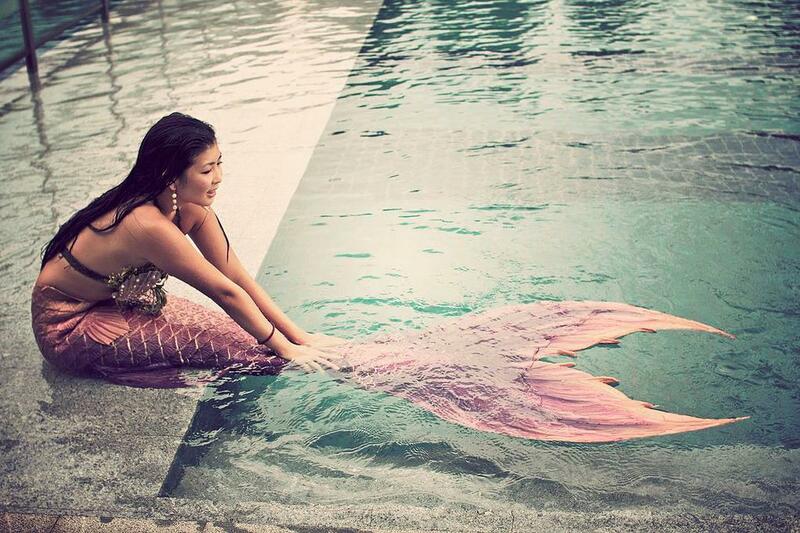 To find out more about Syrena’s mermaid school, visit www.themermaidsyrena.com or her Facebook page. This article is part 4 of a series in which I interview people who practice sports that are less mainstream, and debunk some common misconceptions people have about them.